Taking Cues from Steinbeck and the Bible: Fábio Moon and Gabriel Bá’s Two Brothers, an Adaptation of Milton Hatoum’s Dois Irmãos – LILY & GENEROSO 4EVER! In recent years, the graphic novel has emerged as an alternative medium for literary adaptations. From the writings of Victor Hugo to Edgar Allen Poe, graphic novel writers and artists have begun to dissect and reimagine famous Western literary works into word bubbles and panels of illustration. Generally, I avoid such adaptations (there’s something a bit disorienting about the idea of reading The Black Cat in comicbook panels), but sometimes, when the adaptation is placed in capable hands, a gem can emerge, one that not only has a distinct style of its own but also pays respect to the source material in a way that encourages the readers to delve further into the origin of the adaptation; this is the case with Fábio Moon and Gabriel Bá’s Two Brothers. Adapted from Milton Hatoum’s celebrated novel, Dois Irmãos, released in Brazil in 2000 and translated into English in 2002, Two Brothers opens with the images of an industrialized town center before abruptly transitioning to the haunting, decayed remains of a once glorious European style manor in the Brazilian town of Manaus. Immediately, the narrator, once intimate with the family that lived in the home but not necessarily a member himself, prepares you for a tale of the rivalry between two twin brothers and their disastrous consequences on the people and the world around them. From the start, you know that Two Brothers will follow the course of Cain and Abel or Jacob and Esau, but Hatoum’s tale travels to the bowels of uncertain morality as foreign investment and industrialization creep into Manaus, eliminating its quaint history as a quiet port town and the people tied to the city’s former heart. While Two Brothers certainly alludes to the biblical battle between brothers, it most resembles Steinbeck’s approach to the adaptation of Cain and Abel in the early 20th century in East of Eden. Like Cal and Aron, Omar and Yaqub are twins, with Omar possessing a darker complexion and more sinister in nature like Cal and Yaqub possessing a kinder heart and an affinity for education like Aron. Zana, the twins’ mother, fixates on Omar, a sick and weak infant who required more care as a baby. Omar continues to devour Zana’s affection and attention throughout his growth, and as a result of his mother’s incessant doting, Omar never seeks to accomplish anything because, after all, he will always stand as his mother’s favorite, guaranteeing him a home for the rest of his life or at least as long as his mother is alive. The same cannot be said for Yaqub. As the more accomplished and kinder son, Yaqub must fend off most of the world himself. Zana abandoned Yaqub as an infant, leaving him primarily in the care of Domingas, an orphan given to Zana and Halim as a servant for their home, and this first act bears course on Yaqub’s status in his home for the rest of his life. When an adolescent Omar slices Yaqub’s face open with a broken bottle upon seeing Yaqub with Lívia, a girl both brothers have tried to pursue, Zana and Halim send Yaqub away to Lebanon in the guise of allowing him to learn more about his family’s roots, but in such an act, they cast away their first born son, placing him on a course of aloofness and solidifying the contempt between the two brothers and Yaqub’s conviction to establish himself without the aid of his family. For the first half of the book, Omar emerges as the obvious antagonist in Two Brothers, but by the end, it is difficult to determine whether Omar or Yaqub possesses more evil. While Omar outwardly displays his jealousy toward his brother as Yaqub succeeds as an engineer in Rio de Janeiro, Yaqub quietly holds his spite and acts on it in a more backhanded and manipulative manner. Though Omar has the darker complexion, Yaqub has a permanent scar on his face, a mark which can parallel the mark placed on Cain after he murders Abel. Both brothers have inherent malice and malevolence, but they choose to act on it differently. Omar conveys his evil in the sense of an irresponsible child; he’s hedonistic, violent, lazy, and outrageously selfish. Yaqub’s evil manifests in a more covert manner; he’s a vengeful industrialist determined to wipe away the history of the town and members of his family who made him a pariah. Which is worse? To contrast the graveness of the tale of Omar and Yaqub’s destructive relationship, Moon and Bá (twin brothers who we imagine have a far better standing with each other) illustrate Two Brothers with a deceiving simplicity and lightness. The wilderness surrounding the family home has a certain whimsy to it, and the fading of this magical sense of the jungle into decay then manicured, superficial gardens of a parody of the Orient on the edges of the Amazon jungle best conveys the changing face of Brazil in the years after World War II. The shifts in the settings along with the physical appearance of the characters help to tie each character to a certain place and time and aid us in understanding why as time passes, certain types of people rise as others fall depending on their connection and adaptation to the evolution of society. Though the story of Omar and Yaqub dominate the plot because their actions influence all of the peripheral plotlines and the future of the town of Manaus, Two Brothers, at its core, addresses and explores the psychological motivations of individual family members and how their differing states lead each to interact differently with each other. While Omar and Yaqub do possess inherent evil, the expression of this evil comes from the environment that their parents created in the family home. Halim, the patriarch of the family, never wanted to have a family, and as a result, he keeps a specific distance from his family that prevents him from being a strong parent. Zana displaces her original passion for her husband on her son Omar, alienating the rest of her family. As a result of the psychological states of Zana and Halim, we spend the rest of the Two Brothers studying their impact on their sons and anyone else who crosses the threshold to enter the family home, adding a richness to the story that keeps you engaged with every character and page. 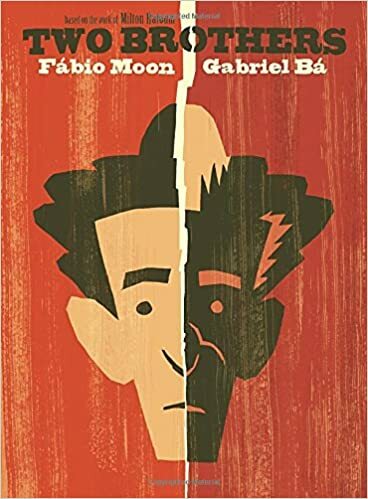 Fábio Moon and Gabriel Bá handle the adaptation of a novel containing severe ideas and concepts with poise and grace, making Two Brothers a captivating and enlightening but never heavy-handed read. They manage to extract the fundamentals of the book without overly simplifying its themes, and in doing so, have me interested in picking up and visiting Hatoum’s original novel, which is a result that every adaptation should try to achieve. After reading Two Brothers, I realize that I perhaps have been too judgemental against graphic novel adaptations of literature. Admittedly, I have avoided the adaptations of works by literary authors I adore, so perhaps I read Two Brothers simply because I have no familiarity with the original work. Thus, my opinion may change after reading Hatoum’s Dois Irmãos, but I can say that a standalone piece, Two Brothers, balances layers of complexity in a graphic novel in a way that few other releases have this year, and for that, it should be commended regardless of its relationship to its source material. Two Brothers by Fábio Moon and Gabriel Bá is available via Dark Horse Comics. It’s a heck of a gift for any graphic novel enthusiast this Christmas.